Finnegan Purl Knits: First 2006 FO! A DK weight cashmere blend on size 3 needles. They will be good for work. 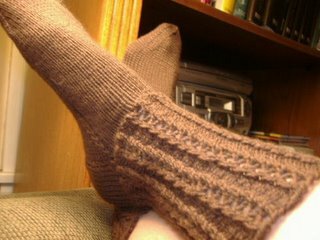 One of the few pairs of socks I ever made that I can actually wear with dress pants. So hopefully my feet will be a little warmer. I want to learn to use the drop spindle my Pittsburgh Secret Pal sent me and I want to learn to do socks on two circular needles. In reality, I've decided that I need to knit a little less this year. My house needs some attention in the way of interior painting and decorating so I have to try to concentrate on that. I put that off long enough because I hate it. But it's time now. With the new grandchild coming, I just need to get some things in order. I need to try to prioritize. I really don't have that much free time as it is. I think if I get a few larger knitting projects completed this year it will be a good year. Wow! Socks on day 3!